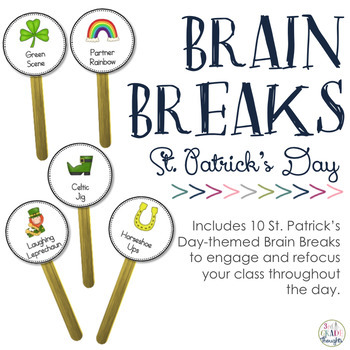 This is a collection of 10 different St. Patrick's Day-themed Brain Breaks for the classroom. These can be used as transitions, breaks in the middle of an activity, something to raise or lower the energy of the group, team-building activities, and more! Activities are focused around St. Patrick's Day and incorporate a lot of movement and humor. Breaks range from simple, individual breaks to whole-class games, so there are many ways to use these into your classroom during the month of March! Each brain break is accompanied by a description of how to do the exercise that can be glued to the back of the popsicle stick making it easy to remember and convenient for subs, too! These illustrations are 2" across with full-color illustrations to illustrate each activity. Use these on popsicle sticks and choose, or place them on a poster for display- the possibilities are endless! A label is also included for a bin or bucket. For my best-selling set of 65 general classroom Brain Breaks, click HERE. For full assembly instructions and some helpful tips, visit my blog post HERE.